In 1438 the Habsburg dynasty had reached some of the most influential positions in Central Europe. Albert the Magnanimous was able to claim not only the duchy of Austria but also the kingdoms of Hungary and Bohemia as well as the prestigious title 'King-Elect of Germany', reserved for those about to be made Emperors of the Holy Roman Empire. Misfortune struck however and Albert fell in battle against the Turks in 1439, leaving only his yet unborn son, Ladislaus the Posthumous, to succeed him. Newborn Ladislaus would have a hard time claiming his legacy, and lost the throne of Hungary after a short civil war to the Polish King Wladyslaw. The Kingdom of Bohemia on the other hand is still divided on the issue. Decades of religious civil wars have left the country ravaged with some parts still dominated by powerful Hussite nobles, heretics to the Catholic faith. Only in Austria, the homeland of the Habsburg dynasty, has Ladislaus been accepted, though his uncle Frederick now rules as his regent. With the catastrophe of Varna the Hungarian throne is again vacant, and Habsburg supporters remain hopeful that it can be reclaimed for Ladislaus. The powerful groups that deposed the boy king once do not seem disposed to accept him a second time. They may well let their dynamic Hungarian regent Janos Hunyadi lead them instead. The dream of a Habsburg Emperor was not lost with Albert. Upon his death, Frederick, the Austrian regent, was elected to lead the Holy Roman Empire. As the first of his family to sit on the Imperial throne Frederick will leave a legacy for future Habsburgs. Should they choose to pursue his careful policies of diplomatic marriages and patient inheritance planning, the Habsburgs may well build up a position of power unlike that of any family among the kings of Europe. The responsibilities of Imperial rule are great obstacles in themselves. An Emperor must keep the peace in the empire, fight heresy such as the recent Hussites and at all costs protect Christianity from the advancing armies of the Ottomans, a power to which the Habsburgs have already lost one King. Austria starts the game as the Emperor of the Holy Roman Empire. It is located in Central Europe, bordered by Bohemia and minor German states to the north and west, Hungary to the east and Venice to the south. As the Emperor of the traditionally fractious German HRE states, it is up to Austria to unify the Empire as the famous Habsburgs and stake their claim on history as a world power. The Emperor of the Holy Roman Empire may be called into defensive wars against outside aggressors, and is also tasked with maintaining order in the empire and enforcing religious unity. Austrian missions are focused around uniting the Habsburg lands and uniting the Holy Roman Empire. Austria's events deal with Austro-Bohemian relations, instability in Austria's holdings in Hungary, famous people of the time period such as Mozart and Metternich, and the Italian Wars. Styria can form Austria if Austria no longer exists. Playing Austria is very different from most other nations in the game and therefore offers a unique experience. Austria should retain the title of Holy Roman Emperor in order to maintain their might as a continental power, which means playing the diplomacy and imperial authority game within the HRE. Thankfully, Austria's national ideas form the one of the best sets of diplomatic ideas in the game. Maintaining allies is also essential as all of Austria's major opponents (particularly France and the Ottomans) have superior military-oriented ideas. Austria is uniquely situated for forming personal unions. Austrian missions give a casus belli for forming a PU with Bohemia on achieving sufficiently high relations with HRE electors, and another for Hungary after increasing development, regardless of dynasty or royal marriage. In addition, as Emperor, Austria gets more diplomats and more relationship slots, thus allowing more marriages, while high starting (and likely continuing) Prestige makes each marriage more likely to result in dynasties, personal unions, or even outright inheritance. Hungary will very quickly be of the same dynasty by event, regardless of the player's choices, but a marriage makes for easier claiming as well as a great ally. As a note, economically Austria is relatively weak in trade due to its home trade node being the inland node of Wien. However Austria is unique in that it has one of the few gold mines in Europe (Tirol) and starts out as Emperor with 8 Free Cities ( ) providing a 16 ducat bonus to taxes each year. The inflation from the gold mine can be managed by either Economic Ideas, Austria's third national idea, or by using Papal Influence to choose the Forgive Usury action that reduces inflation. Austria is also perhaps in the best position to form the Holy Roman Empire, due to starting as Emperor, having several diplomatic oriented national ideas, and their relative position and strength in the empire to enforce their will on the other Princes. Following the steps below will help ensure the player can form the Empire at a relatively quick pace. Imperial provinces under the control of non-members or subjects of non-members −.005 per province. Other mechanics can be seen at Holy Roman Empire. The provinces in red must be added to the HRE by 1490 to prevent the Shadow Kingdom event. The Empire can be greatly strengthened by preventing the Shadow Kingdom event, which causes all of the Italy region to leave the Empire. 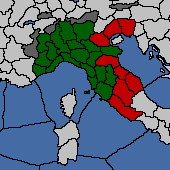 Preventing the Shadow Kingdom event requires adding eight more provinces to the HRE: Venice's Treviso, Friuli, and Verona, Urbino's Urbino, and The Papal State's Ancona, Romagna, Umbria, and Roma. If all these provinces are in the HRE from 1490 to 1550, the event cannot fire. The Rein in Northern Italy decision allows some extra flexibility in achieving this goal. This decision adds the emperor's (& subjects') Italian provinces to the HRE immediately, and prevents the Shadow Kingdom event forever. Thus, Austria can take some or all of the provinces with vassals or PUs, without needing to hold them directly to add them to the HRE as normal. This does mean losing the potential Imperial Authority bonus from adding those provinces normally. One thing to be aware of is the negative effects of war with the The Papal State and control of Rome. Wars obviously involve negative relations with the Papal State, and that reduces Papal Influence. More importantly, a Catholic owning Rome directly or through a vassal causes The Occupation of Rome modifier that decreases valuable diplomatic reputation and gives an extremely large Papal Influence malus, while vassalizing the Papal State causes the Subjugation of the Papacy modifier, decreasing diplomatic reputation even more, though without the influence penalty. The simplest way to deal with this is to forcibly annex Roma, but do it last, immediately before the player intends to use the Rein in Northern Italy decision. Once taken, a one-time event will fire very soon where the Pope asks for Rome back (long before the player has a chance to finish coring it or adding it to the HRE). If it is returned, the malus is removed. So capturing, enacting the decision, and then returning the province avoids the penalties. Ultimately, preventing the Shadow Kingdom event means more Imperial Authority through more princes in the Empire, but it also means more wars to keep minor states in line, and potentially more princes to fall victim to the Reformation spread. Careful management will be needed to ensure that Austria can keep the Italian princes in line with the rest of the Empire. However, it may not be up to you or your ability to keep the Italian Princes in line. If the Burgundian Succession AND Hungary's Automatic Personal Union doesn't fire, the effort to Reign in Italy will allow the Reformation to run rampant in the HRE and will destroy whatever imperial authority you managed to save in Italy. Burgundy through Personal Unions controls Imperial territory in Holland and Brabant, as well as five Imperial provinces of its own, making eleven. This is by far the largest drain on monthly Imperial Authority in 1444. Through the Burgundian Succession Crisis (a luck-based event), which can give direct control over all provinces already in the Holy Roman Empire currently controlled by Burgundy or its subjects. The event's effects are improved if the player has a Royal Marriage with Burgundy and the event is more likely to fire if Burgundy is in a war, and losing. Note though that France will generally receive control of the Bourgogne, Picardie, Artois, Charolais, Nevers, and Rethel provinces. The player can choose to release the princes after inheriting their land for more Imperial Authority; either way, this can form another base of territory in the Empire to keep the princes in line. This method is ideal, since it involves no wars, no costs, and no aggressive expansion, but the event may or may not occur so it cannot be counted on. War forcing Burgundy to move their capital to one of their Imperial provinces. This causes Burgundy to become an Imperial prince thus restoring all Imperial provinces to the Empire as well as bringing both Brabant and Holland back into Imperial arms. In recent patches, a country must have no other non-Imperial provinces when their capital is taken in order to move it to Imperial territory. The provinces to remove are thus Picardie and Artois (which can be released together as a vassal), Charolais, and the capital Bourgogne. Additionally, in order to take the last two the player must take Franche-Comté unless other area nearby has already been taken from others such as Savoy or Lorraine. All of this is made much easier (and thus possible with a single war) by having Picardie and Artois already in another nation's hands: France has missions and England generally fabricates claims. If the Burgundian Succession Crisis happens after this, France's only remaining gains will be Nevers's provinces: Nevers & Rethel. This method leaves France weakest, and gives Austria some direct territory, but garners a large amount of aggressive expansion. At least two wars, canceling the subjects of Holland & Brabant (ideally done first as this makes further wars easier), releasing Hainaut & Luxembourg, and reclaiming Franche-Comté. If the Burgundian Succession Crisis happens afterward, France generally gains whatever Burgundy has left other than Flanders. This means all 6 normal provinces: Bourgogne, Picardie, Artois, Charolais, Nevers, and Rethel. This method can involve little or no aggressive expansion (depending on what is done with Franche-Comté), which is useful if taking other land nearby. For the player, the effect is almost the same as if the Burgundian Succession Crisis event had happened in their favor, though obviously at the cost of the wars. Provence at the start is the suzerain of Lorraine (Metz and Lothringen) and controls the Imperial territory of Barrois, from which the player can release Bar to have an extra prince. As this is three Imperial provinces, it's important to handle, but Provence is allied with France to begin. For a super aggressive start, the player can fabricate claims on Lothringen, get a big ally (such as Burgundy or Hungary), wait until France/Provence is at war or just finished one, and then use the claim to declare war. It's possible to damage France, take their money, and even humiliate them for Power Projection if they're a rival. Once France is out of the fight, Provence can be focused. At the start, Provence is just small enough to vassalize, which will also release Lorraine. This causes a bit of aggressive expansion, but will eventually allow the player to annex Provence, getting cores next to France and adding territory to the Empire for a boost to Imperial Authority. Holstein is also part of the Empire, but is a vassal under Denmark. If Denmark goes to war with the Empire early and loses, it is possible that Holstein may be released, but it is otherwise annexed fairly quickly and thus difficult to get back. It may be advisable to leave this province as the one lost cause, at least until the player is strong enough to handle Denmark. Neumark, a core of Brandenburg and province of the Empire, starts under Teutonic Order's control at the start. There is an event that can allow the TO to sell Neumark to Brandenburg, but otherwise Brandenburg will usually get it via war. Brescia, a Venetian province, is also part of the Empire, and can usually be returned to Milan should Austria go to war with Venice to add their provinces to the Empire. Do note that since Brescia is already an HRE province, it does not need to be controlled to avoid the Shadow Kingdom event or to use the Rein in Northern Italy decision. If the first Imperial Reform is passed, the Imperial Ban casus belli may be used to secure these provinces. For the Holy Roman Emperor, the Reformation is effectively an unavoidable disaster that affects the entire Empire. Princes will convert as their provinces are converted, and each prince that does so causes an Imperial Authority growth penalty. Furthermore, any of the player's provinces that get converted (or any converted provinces taken in war) are still very difficult to change back as missionary strength is quite low to start. The simplest method for handling the Reformation is to use the Emperor diplomacy options to enforce your religion on each prince as they convert. Assuming that they like the Emperor enough or he has enough diplomatic reputation, they will convert back at the cost of a single point of Imperial Authority and some relation points. When this occurs, their capital is immediately converted, and if there was a Center of Reformation in that location, it is removed. Furthermore, the prince will then work to reconvert their own heretic provinces. This will not work in all cases, however. The Emperor will likely have enemies in the HRE that will refuse the request, and it is not possible to even ask this of Electors. Thus, the second simplest method is going to war with the country (perhaps by attacking their allies, if they are difficult to get a CB upon themselves). For a heretic country, a war option is conversion, which has a higher war score cost depending on how many provinces are of the heretic religion. Successfully enforcing this concession has the same effect as above: their capital is immediately converted, also removing any Center of Reformation there. It can often be worth declaring a no-CB war if required in order to remove a Center. If a country is too big to convert via war concession, the next option is to take some of the converted provinces, especially a province with a Center of Reformation, with the hope of force-converting in a second war. This can be painful, as the converted provinces will obviously reduce religious unity and will have high unrest, and religious zeal will prevent their conversion until ten years after they were first converted. Centers of Reformation, however, can be reconverted immediately (assuming one has the missionary strength to do so), and as soon as the conversion is complete the Center is removed. For this path, taking the Religious Idea group can be very beneficial if not actually required. As having a heretic Elector is especially bad, there is one final option: going to war to revoke their Electorate. This carries a whopping ten point penalty to Imperial Authority and some relations penalties with other Electors, but if successful allows the Emperor to choose a new (hopefully loyal) Elector. The no-longer-Elector prince is then able to be converted normally. As the malus is especially egregious, this method is not recommended unless there are no other options. It is possible for a Center of Reformation to appear in an area that the player cannot or should not do something about. One in Denmark, Spain, or Poland, for example, can be difficult to remove. As long as it is outside the Empire, their conversion of HRE provinces should be slowed and the effects should be infrequent enough to handle without too much difficulty. Still, taking said Center or making them change it should be added to the list of priorities for some future date. One way to reduce the impact of the Reformation is by acting before it occurs. Let single-province countries like Friesland or Oldenburg be annexed by larger countries to prevent Centers of Reformation and religious rebels from instantly converting these princes. This decreases Imperial Authority tick, as there are fewer princes, but they may be released after 1650 if their cores still exist. With the above methods this may be unnecessary, but it can still be helpful, especially if one has not yet had the chance to take the Religious Idea group or chooses not to do so. If the player wishes to convert to Protestantism themselves, it must be noted is that an election will be triggered if the player is the emperor. The player will not be eligible to be emperor again until a Holy War has been won or tied (Peace of Westphalia). This conversion path would only make strategic sense if the Reformation has been very successful, the player already is struggling with low religious unity and/or the player has already lost the throne (especially to a weak nation that is more likely to lose a Holy War). Being protestant does give a +15% relations benefit, which is helpful for an emperor. Another strategy is to intentionally allow Italy to leave during the Shadow Kingdom Event. This allows you to ensure early Personal Unions over Bohemia and Hungary, and to force Burgundy to release HRE provinces back into the HRE. Finally, your extra time can be spent gaining small chunks territory in Northern Germany that would allow to claim a province of protests princes and force convert them. While this is not ideal, remember that heretic princes will be more of a threat to Imperial Authority than the amount of princes in the HRE. Finally this strategy allows you to better manage the HRE over the long run. As the likely end goal for Austria is to unite the Empire into a single nation and this is done without all the usual diplomatic monarch point expenditure of diplo-annexing, a strong late game goal is to grow the HRE. One easy way to do this is to revive peripheral nations with cores outside the realm. The Teutonic Order is often swallowed whole by Poland/Commonwealth. It can easily be freed from Brandenburg in one of the typical wars necessary to free captured duchies and then a Imperial Liberation CB can be used on Poland to take back Prussian provinces. Teutonic Order. Similarly, Burgundy's capital is often driven by France into its provinces within the HRE, making it a member. At this point, Imperial Liberation can be used to reclaim Burgundy. Since nations on the periphery of of the Empire are typically threatened by a strong France, Commonwealth or Scandinavia, they typically add captured provinces to the Empire if they have good relations with the emperor. This makes them good allies or vassals if the emperor is strong and has the empire under control enough to take on the big neighbors. Diplomatic or Influence are strong contenders for first idea group due to the importance of holding onto the Holy Roman Emperor title. Both grant an +1 diplomatic relations and +2 diplomatic reputation (+10 modifier for elections and +5 per point for supporting Empire reforms). Influence enables faster expansion due to reduced aggressive expansion ( −20%) and reduced diplomatic annexation costs ( −25%). Diplomacy, however, may have better events (including one that could give +5 Imperial Authority), better improved relations ( +25%), and free royal marriage breaking (from −1 stability to −1 prestige). 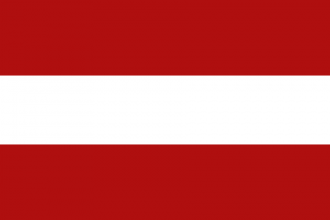 Offensive or Defensive are both helpful to Austria as a major land power that must repel hostile invasions on the HRE. Offensive may be slightly more useful due to the need to wage many small wars within the HRE to free annexed states, as Engineer Corps decreases the length of siege times +20% and Grand Army provides a larger force limit +20% to win battles against the French, Ottoman or Polish armies. Religious or Humanism may be essential by the third idea group in order to counter the heretics during the Reformation. It is in the Emperor's interest to remain Catholic and convert Protestant/ Reformed princes back to Catholicism which makes Religious a strong choice. However, if the Reformation starts right next to or within Austria, Humanism may be necessary to prevent the religious turmoil disaster. Alternatively, the Religious-Offensive policy (Anti-Heresy Act) offers a powerful bonus ( +20% Religious Unity, +3% Missionary Strength vs Heretic) for a −1 monarch point upkeep cost.